"If you think you need a little help in your calculus course and you don't want to spend a fortune, you should take a serious look at Pablo Antuna's Limits Mastery Course. It's an incredible value..."
Every Problem on Limits, Specially Those Usually Found On Actual Real-Life Tests"
If You're "Spinning Your Wheels"
The concise and to-the-point information and exercises in this eBook will guarantee your success in any calculus course in record time, for next to nothing! In a hurry? Don't have 2 or 3 minutes to scan all the features now? Click Here for the bottom line summary. I'm sure you're well aware that a calculus course is among the most challenging and important courses you'll ever take, even if you always considered yourself "good at math". After all, calculus is the first time you come in contact with "real math", and succeeding in this course will have a major impact on your carreer path. I have good news for your peace of mind. You don't need to be among those. The Limits Mastery Course will take you step by step through everything you need to know about the first and most important topic in calculus: Limits. And it won't cost you an arm and a leg! Before I get into the details, let me introduce myself. My name is Pablo Antuna. I majored in engineering and I'm on my way to my math master's degree. I tutored calculus students for a few years and I realized something that that will help you succeed in calculus and proceed in the achievement of your goals. It wasn't long after I started tutoring calculus students that I realized there are a lot a lot of people out there desperate for some help in every topic in calculus. But that's not the textbook writer's fault. There are exelent calculus textbooks out there. But the thing is that the authors are required to be really exact (in a formal mathematical sense) in their treatment of the subject. If they're not, their textbooks wouldn't be taken seriously by teachers, who in turn wouldn't use the textbook in their courses. The result is that the textbook is always difficult to understand for the student. I'm not saying that the approach taken by most textbooks is wrong. However, most students need a gentler introduction. I launched my website Intuitive Calculus as a way to help students get an intuitive introduction to calculus, without ignoring the practical problem solving involved in any calculus course. I receive thousands of visitors monthly, and many of them contact me and tell me that the site is great, but could I help them with a particular problem, for example on derivatives. And what I realized is that many of these askers don't have a proper foundation in an essential topic: Limits. You see, all other calculus concepts are based on the idea of limits. Also, the problem-solving techniques you learn while studying limits are the basis for almost all other techniques in calculus. If you don't have a deep intuitive understanding of limits, all of the following topics would be harder for you. That's not because they're harder in themselves, but because you just don't have the proper foundation. While researching the problem on how to help people succeed in learning limits, I realized that there is a gaping hole when it comes to the limited "how-to" information available on the subject. Sure, there are a few good sites and "how-to" papaerbacks here and there, but they are largely compilations of solutions of old problems. They don't put it all together in an accessible toolkit fashion. In fact, many of these books are just invitations to memorize things. Something you definitely don't want to do if you want real deep learning to happen. I just couldn't find any real "hands on" book focused on the student that would actually help you succeed in any calculus course from scratch. So, I decided that the best way to present this tool was in e-book format. In that way, it would accessible to almost anyone in the world. Also, when you have something in a book, you can focus much more easily than when you just read it on the web. I also decided to divide it in topics, so you could focus on what you most need help with. In this case we're talking about the part of the tool focused on limits. I believe this to be the most important one, as it really determines whether or not you'll succeed in all other topics. The Limits Mastery Course is more than just another calculus textboook. 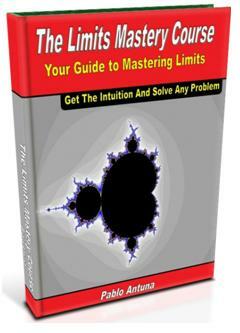 It is a complete and comprehensive "toolkit" to help you master limits. You'll have everything you need to succeed in any calculus course using this comprehensive toolkit filled with advice, tips, tricks, tools and problems taken from real-life exams. Develop a deep intuitive understanding of limits. I've studied and taught calculus and I've noticed the main difference between students that excel and those that have a hard time: those who excel develop an intuitive understanding. They form pictures in their mind, graph functions and other things that help their understanding. This e-book will teach you how to do that. How to solve every imaginable limit problem, with examples step by step. You'll get the practice you need with the exercises (each type of exercise has a similar problem solved as an example). The harder problems are taken from actual tests. How to recognize instantly what technique you should use to solve a particular problem. One-sided limits and piecewise functions are giving you a hard time? Here I'll show you a graphical method to tackle problems involving these things. Solve any limit involving trigonometric functions with a single technique. How to recognize an "infinite" limit instantly. You'll also find a final section of exercises to test your skills. I carefully selected them to test all the techniques. I guarantee you that if you are able to solve all of them, you are ready to tackle any problem on limits. As you can clearly see from the above list, The Limits Mastery Course is MORE than just a bunch of hastily thrown together solved problems. Rather, it is a complete and comprehensive manual that takes you step by step. Now, let's do a little math here, ;). Your average calculus textbook costs $150, and we can roughly divide it into three subjects: limits, derivatives and integrals. So, for learning limits, we could say you're paying $50. Also, don't forget that this course is more than just a textbook. It is a complete how-to manual! It has the quality of teaching that only a very good tutor can give you. And I don't want to go into how much a good tutor could cost you. Just go to this page to check for yourself. I'm sure you're going to come back here after seeing that. You Can't Afford NOT To Get It! One of my first objectives with this course is to make it accesible just to anyone who is serious about succeeding in calculus. I wanted to make sure the price stays well below what most textbooks and tutors cost. In fact, when one considers the value of the information and tools included in The Limits Mastery Course, the price is almost unbelievably low. Professional pricing research has revealed that for a unique eBook like this course, I should be charging somewhere between $25 and $40 per copy. That being said, I'm almost embarrassed to tell you how low I have priced this ebook during its initial market launch phase. Because The Limits Mastery Course has just recently been released for the very first time, I've decided to charge a super-low Special Introductory Price of $19.97. Whoa! That's what an average tutor will charge you for about 15 minutes work! Think about that! But more importantly, how much is worth to you succeeding at calculus? For most people that is priceless. Understanding the concepts of calculus will give you great confidence. You'll no longer be afraid of math, any math. You'll be able to choose any career path you want, without the need to "avoid" math. If your future is at stake, and you need to succeed at calculus to progress in the achievement of your career goals, this eBook will make your success inevitable (if you complete all the chapters and do the exercises!). Soon, that price will be going up. But right now, in order to reach the widest possible audience I have decided to offer this toolkit at this special low market penetration price. You can download the course right here. Here's Your 100% Solid Gold Risk-Free Guarantee! "I personally guarantee that if you make an honest effort and do the exercises in this ebook you will save yourself money, time, ºsles. So, you've got two full months (8 weeks) to study and use this material. If during that period you aren't fully satisfied let me know and I'll issue you an immediate no-hassle refund." Buy with confidence from Clickbank, the authorized retailer of The Limits Master Course, where your transaction will be handled by a secure server. Clickbank currently sells more than 10,000 digital products online, and the number is growing daily. If you happen to ask for a refund, it is Clickbank's policy to send money back immediately. Give the Limits Mastery Course a good try and DO the exercises. If after 8 weeksyou still feel that you're not making progress in your study of calculus, then contact me and you will receive a full refund. Master The Most Important Topic In Calculus..."
Get ready! In just a few minutes you will be the owner of THE definitive resource for succeeding in learning limits. P.S. ---- If you came to this Web site looking for information on a specific topic related to limits, this eBook was created for you. If you're looking for a resource that will give you all the tools to succeed at learning limits in calculus, this is it. And you can order it here right now! P.P.S. -- You've got lots to gain and nothing to lose with my two-month Risk Free Money Back Guarantee. Besides, what's your future worth? If this ebook helps you understand only one topic related to limits, you'll already have the cost of the ebook covered. So do yourself a favor and order it now before the price goes up!